TOKYO (AP) — Nissan Executive Vice President Daniele Schillaci bowed deeply for several seconds in a Japanese-style apology Wednesday, expressing his remorse for widespread illegal inspections at the automaker. "I would like to take this opportunity to express a sincere apology for our recent issues," he said at the Nissan Motor Co. booth at the Tokyo Motor Show. "We sincerely regret any inconvenience and concern this has caused our valued customers." This year's show highlights smart and green vehicles that talk, connect online and stop on their own before crashes. But scandals surfacing within weeks of the auto show, including another one at Kobe Steel that's hit the entire industry, are casting a shadow over the festivities. Reporters got a preview of the show at Tokyo Big Sight hall, ahead of its opening to the public Saturday. Schillaci switched from his nearly tearful apology to an upbeat demeanor after a resonating electronic beep — the special sound called Canto, designed for Nissan electric cars to protect pedestrians. Electric cars are extremely quiet compared to gas-engine cars, and people have complained about not being aware of their approaching. "What you just heard is the sound of the future," he said, proceeding happily with his presentation on automated driving and electric sports cars. Taking center stage at the Nissan booth was a sleek zero-emissions electric "concept" car, billed as "Nissan intelligent mobility." It comes with surrounding 360-degree sensors capability from radars, cameras, lasers and sonars, to deliver accident-free driving as well as a future in which the car can drop its owner off somewhere before parking or returning home, according to Schillaci. Japanese automakers have been hit by a series of scandals in recent years, including a massive recall of defective air-bags made by Japanese supplier Takata Corp. that involves some 100 million air-bag inflators worldwide. The defect has been linked to 19 deaths and dozens of injuries. The global industry has also been rocked by a scandal at Volkswagen AG of Germany over cars it had illegally rigged to cheat on U.S. emissions tests. Nissan, allied with Renault SA of France, acknowledged last month inspection irregularities had been going on for years at its plants in Japan, with the final inspections routinely done by unauthorized staff. Shortly after apologizing for that, Nissan said the illegal checks had continued. It has halted production in Japan for the domestic market until it can figure out how a recurrence can be prevented. Nissan company officials say the practice was so ingrained it was hard to change. Better communication is needed among managers, and production will not resume until the government gives its approval, they said. Thousands of cars will have to be re-inspected. "We have formed an investigative team with a third party, which is working hard to find out what happened and why," said Schallaci. He said the company was working to prevent a recurrence. The other scandal, over the falsification of data at Kobe Steel, spans dozens of products made of steel, aluminum, copper and other materials, affecting some 500 companies including major automakers around the world and the aircraft, electronics and railway industries. Toyota Motor Corp. Executive Vice President Didier Leroy said Toyota was checking aluminum plates and other Kobe Steel components used in its models and had found no safety or quality problems so far. "We were very worried," he told reporters. "We deeply apologize to our customers." He declined to comment on Nissan's scandal, but stressed all of Toyota's inspections are being carried out according to regulations, by qualified inspectors. 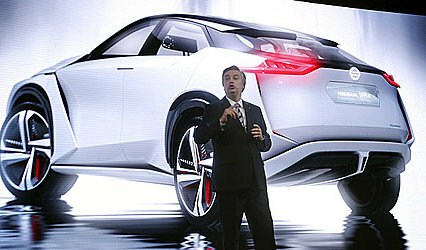 Leroy rejected the idea that the scandals may hinder Toyota's ability to develop zero-emission and "smart" vehicles or that Japan may be falling behind in such technologies. Analysts say Japan has no time to waste on cleaning up after scandals given the big push by U.S. players like Google, General Motors and Uber to put self-driving cars on the roads, possibly within five to 10 years. "Introduction of self-driving cars will lead to new business models," said Bart Selman, a professor of computer science at Cornell University. The Japanese could catch up with rivals if they move quickly, he said. "This means the space is very competitive. There will quite likely be just a few surviving companies to handle all demand." U.S. automakers, such as General Motors Co. and Ford Motor Co., are skipping the show. They have long struggled in the Japanese market, which is dominated by the domestic brands.